Seriously, it’s not just males who eat quickly, without thinking either. Many people have developed the habit of eating as fast as possible. Often it’s because you developed the habit while in elementary school, when lunch breaks were short. And then you continued when you got home from school, wolfing down dinner in order to get to some rehearsal, or practice, or study session on time. Now as an adult, you work long hours, rush home through painful traffic or an overly-crowded public transportation, only to rush through eating again, because there are bills to pay, bathrooms to clean, kids to shuttle…. When they ate quickly, they consumed 646 calories in 9 minutes. When eating slowly, they consumed 579 calories in 29 minutes. That’s 67 fewer calories in 20 more minutes! In addition, when they ate slowly, the women drank 7 oz of water (fast) vs. 14 oz (slow). If you imagine these kinds of results three times a day, seven days a week, week after week, you can see how quickly these women would eat more calories and drink less water, when eating fast. I mean, that’s an additional 1,407 calories each week! – Eat more high-fiber foods (like fruits and vegetables) that take longer to digest. – Cut your bites smaller before putting them in your mouth. Then actually count how many times you chew before swallowing. – Drink a glass of water before you sit down to eat – and during the meal – as this will make you feel more full, and less desperate to get the food into your mouth. – Use smaller plates for smaller portions. – Give yourself at least 20 to 30 minutes to eat…. Not the usual 5 to 10. – Pause to consider where your food came from. The people who harvested it, transported it, stocked the shelves with it, and prepared it; maybe even the animals that were raised for your sustenance. Consider the cultural traditions that brought you to that table, and the recipes shared among family and friends. When you stop to consider all this, it may slow you down and help you make wise choices about sustainability and healthy food. If you’re like most people I know, you probably lead a pretty busy, hectic life. But when you mindfully, intentionally slow down during your mealtime, you will feel healthier, have more control over your weight, and feel more connected to your food and to those at the table with you. I’m challenging you to give it a try for the next few weeks and see how it makes you feel. I’d love to have the chance to speak with you about this, and other health issues that you may be wondering about. 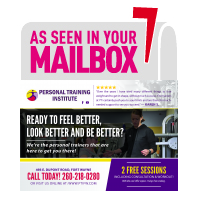 Please shoot me a message at fitness@ptifortwayne.net and we’ll schedule a time to chat. I look forward to speaking with you!